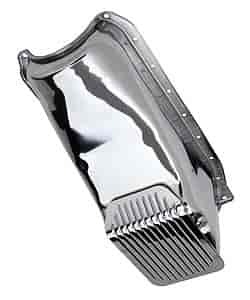 Trans-Dapt Armor Plated Slam Guard Oil Pans are designed for use on lowered street cars or off-road trucks and Jeeps. Each Slam Guard Engine Oil Pan is constructed with a 3/16" thick skid plate to protect against damage from bottoming out. The skid plate is integrated into the pan by removing the sump floor and welding the armor plate into position. Trans-Dapt has machined these Slam Guard Oil Pans from strong, quality materials with choice of chrome plating or black or silver powdercoating for durability. Slam Guard Oil Pans are available for use in 1-piece and 2-piece rear main seal small block Chevy, Windsor-based small block Ford for passenger cars, and Jeep/AMC 304, 360, and 401 V8. Included with each slam guard oil pan is a matching finish magnetic drain plug. Gaskets and hardware sold separately. Does Trans Dapt 8914 fit your vehicle?